If you analyze the great cultures of antiquity, you’d find their success was due to geography and personality -- the geography of their physical space and personality of the people in that space. There are countless examples in history where cultures failed to develop when one of these factors was missing. Geography is the obvious contributor because you can measure its influence -- living by the sea can foster shipping; flat open land will support farming; and the presence of natural resources can build a business trading that asset. Personality is harder to pin down because it’s intangible. What is it that makes one people motivated enough to drive cultural development and another less so? There are many cases in history where two groups occupied the same space and only one flourished, but we really don’t understand the reasons for this. Fluorescence is a term anthropologists use to describe a period of rapid development, when the growth of culture accelerates. Often this growth is economically driven when markets open up for skills or goods. Other times, there is no obvious economic driver and it’s just human effort that pushes things forward. In the case of Mesopotamia, for example, it was technology that triggered the advance. Its fluorescent period began when the technical problems of irrigation farming were resolved and crops could be produced in large quantities. In most instances, geography has been the mainspring of cultural development, serving as primary influence over food production, trade, raw materials, migration, and protection from enemies. In this post, however, we’ll present a different story -- one that saw personality as the prime mover in building the Roman Republic. Rome is located on the eastern side of the Tiber River amongst its famous seven hills. It’s latitude is forty one degrees north, slightly south of the position of Chicago in the United States, but unlike Chicago, Rome is blessed with a Mediterranean climate. Rome’s location in ancient times put it eighteen miles from the mouth of the Tiber where the river empties into the Tyrrhenian Sea. More importantly, there was a ford over the Tiber, near the ancient settlements and situated on the crossroads of a trading route, that allowed commerce to the other side of the river. Surrounding the site of Rome was flat farmland featuring rich volcanic soil put down around 10,000 B.C. That’s the geographic set up. What about the people? From the original settler’s point of view, the site of Rome offered protection from the west via the Tiber and protection at the site from the hills. 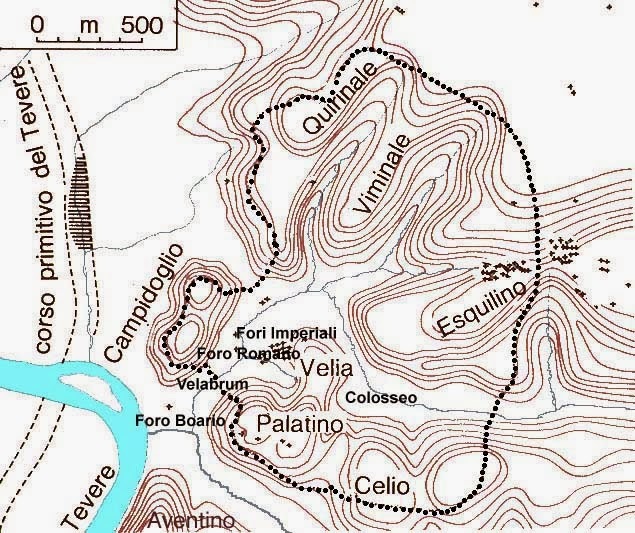 Two of them, the Capitoline and the Palatine, were quite steep and difficult to climb. Between these hills sat a marshy swamp. There is evidence of settlements in this area dating to 8000 B.C. and by 800 B.C, there were at least two villages: Rumi on the Palatine Hill and Titientes on the Quirinal. The local inhabitants were mostly Latin and Sabine tribes, the latter a spinoff of the Sabine hill people living on the western slopes of the Apennines. Other tribes in the area included Umbrian’s, Samnites, and Oscan’s. A “Latin League” was formed in the eighth century, with Rome as a member, to protect the Latin villages from the Etruscans, but over time, as Rome came under control of Etruscan monarchs, it separated itself from its former allies. Etruscan kings ruled Rome from the seventh century through 509 B.C. when they were forcibly expelled, because the Romans wanted to end the monarchy and live under a Republic. The Romans rejected not only the Etruscan king, but the Etruscan philosophy and way of life, co-opting some of its useful cultural elements as they moved on. By this time, the Roman ethnicity was separate from the rest of the Latins. There was something about those Roman Latins that made them different; perhaps the time under the yoke of the Etruscans changed their personality, or maybe it evolved on its own. From the very beginning of the Republic, the Romans had a drive that set them apart from their neighbors -- a drive to build a Republican political system that would give the people more control than they had under an outsider, and use it to advance their agrarian culture. The idea of a Republic was not unique to Rome because the trend around the Mediterranean was in that direction. Many cultures, including the Greeks, were rejecting the monarchical model, but none of Rome’s neighbors had this inclination and none had the drive to grow and diversify their culture. As Rome grew, the Etruscan time would eclipse. As Rome grew, it would take over the Greek cities. Eventually, that small village of Latins would control Europe! The Romans had another trait that set them apart -- their engineering mindset. I don’t imagine there has ever been a people on earth with a more structured view of their world and a greater desire to build things. Roads, aqueducts, buildings, army camps, and military discipline are only some examples of the Roman structural view. Oddly, this obsession didn’t leave room for a lot of original thinking. The Romans stole whatever they found interesting in other cultures, including gods, and improved on them. Thinking-wise they were never in a league with the Greeks, but employed them as physicians, educators, and philosophers. Let’s revisit geography for a minute. The Romans were agrarians because they had high quality soil and they lived inland away from the sea. It never occurred to them to use the sea for their own purposes until they were forced to deal with Carthage at the beginning of the First Punic War. Still, there was nothing unique in their geography that could ignite a new culture on its own. Rome became fluorescent when it first thought of getting rid of the monarch. The Senate and Assembly were already in operation so all that remained was the creation of an administrative magistrate’s role. The healthy agrarian economy would fund the young Republic and take it places its founders could never have imagined, but it was the people and their will that served as the engine. I loved this kind of article; really describing Romanitas. It is the racial proclivity of the Romans. There is a grand error in thinking that "All races are the same and/or equal". Anyone with an ounce of integrity, honesty and truthfulness will see that there is a big difference between Greeks and Romans. Furthermore, there have been many books written about the Etruscans, but I have found none, and no research on the Sabines. What I have found is that the Sabines claimes to be Doric Greeks. This is in ancient literature. What about Titius Tatius, a Sabine king. There were a couple of Sabine kings that ruled over the Latins. Plutarch said there were many "Spartan" institutions among the Romans; from what I guess was from the Sabines. The two governments are the same and there can NOT be a coincidence that the upper body of both governments were named "Old Men" in their respective languages. Great article and I will use it to reference to. Thanks for writing it. Italy is now the most genetically diverse population in Europe, which I presume is a reflection of its history as the hub of trade in people and dependence of the economy on slave labour, and the army on mercenaries/auxiliaries. However, as a small group of people, if you are going to subjugate millions, enslave and exterminate anyone you choose, you do have to have a belief in you own superiority, which you can demonstrate by your ability to destroy any other culture. I like the importance of geography; for example, Roman use of mortars and cements was a reflection of the local geology. Being some distance from the sea made them less susceptible to naval attack, allowing resources to be invested in other areas. I think Political institutions reflect the practicalities of a culture. Those Greek states dependent on a communal shipping enterprise/piracy abroad and suppression of rural population at home tended to develop a limited democratic model, those like the Spartans whose primary need was local control maintained a more traditional distribution of power. The mix of geography and politics was my favourite at university (after zoology), and I've always admired those of you who can tell a story with an historical perspective and with that, inspire the rest of us who cannot.